Kyomuhendo Kereni bends over to move rocks from the dark brown sand into the basin. As a 60 year old woman, Kyomuhendo may not be who you would automatically think fits the profile of a miner. But she is one of the more than 3,000 people who have moved to this artisanal gold rush mine site in Central Uganda, seeking better opportunities for herself and her family. Women are an essential part to artisanal mining, from panning and processing, to trading goods and services. But until recently, their full role and the barriers they face hasn’t been fully explored. Last March, Abby Sebina-Zziwa from Uganda’s Development Research and Social Policy Analysis Center (DRASPAC) traveled to the mine site in Central Uganda to meet with Kyomuhendo and other community members. DRASPAC partnered with IMPACT and Carleton University to understand women’s livelihoods in two artisanal mine sites in Uganda. Abby and her team were bringing the results of three years of analysis from surveys, focus groups, and interviews with the community. 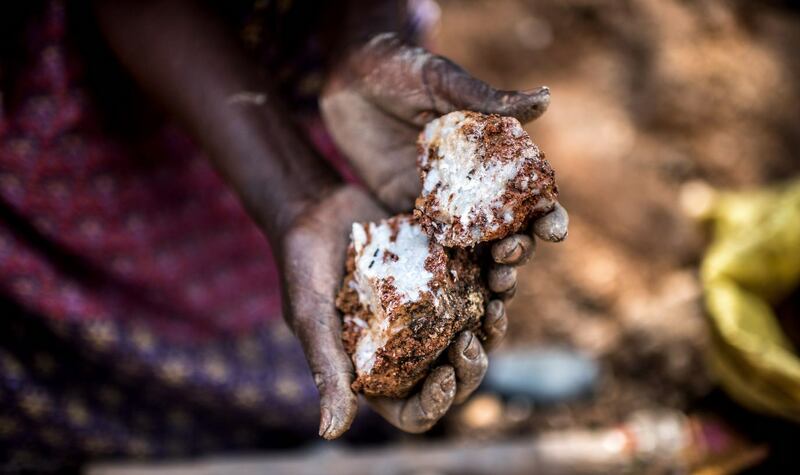 The findings were clear: women’s contribution in artisanal mining cannot be ignored, yet women are facing significant inequality that needs to be addressed. At the artisanal gold mine site where Kyomuhendo works, more than a third of the miners are women. They’re working in the sector because it pays better than any other job they can find in Uganda. They can earn three times more from mining than other income generating activities such as farming or running a shop or restaurant. Kyomuhendo herself turned to artisanal mining after years in farming. Despite it being a better paid sector for women, there is a significant disparity in how much women are paid. Women at the artisanal gold mine site earn only half of what men earn, and often have to take on the least paid roles such as digging and panning. Abby and her team worked with the community to develop recommendations for policymakers to address these challenges and promote women’s empowerment in Uganda’s mining sector. It’s an ideal time as Uganda’s mining policy is up for reform, with a focus on integrating artisanal miners into the formal economy and supporting gender equality. At the artisanal gold mine site, women are calling for increased support for their participation in the sector. At the mine site, over 65 percent of women who participated in the research are major contributors to their household. Like Kyomuhendo, who has been able to pay for her grandchildren’s schools fees, women use the income they earn to pay for housing and school, and to buy land for homes or farming. After six years at the gold mine site, Kyomuhendo is the chairperson on the local council. She is in a unique position as women’s participation is often constrained by traditional roles and a lack of technical training. Women are calling for an increase in training and capacity building, so these types of leadership opportunities can be be further opened up to others. Kyomuhendo is now hoping to save enough money to return to farming. But her experience and those of other women artisanal miners, lays the foundation for others who seek brighter futures through mining. Research in Uganda was part of the Women in Artisanal and Small-Scale Mining (ASM) in Central and East Africa project exploring women’s livelihoods in the artisanal mining of 3Ts (tin, tantalum, tungsten) and gold within the Democratic Republic of Congo, Rwanda, and Uganda. Research was part of the Growth and Economic Opportunities for Women (GrOW) program, jointly funded by the UK’s Department for International Development (DfID), the William and Flora Hewlett Foundation, and Canada’s International Development Research Centre. Additional funding was provided by Global Affairs Canada.